It's me again and I'm back with another problem I can't really solve. So I started a new project and at the early stages it worked fine as you can see here https://videavice.itch.io/a-hunters-tal ... nkdfVgs0Q but once I finished the whole thing it became impossible to run in engine and browser(loading issues again). It basically started to act up when it added the sound files. I'm giving you the link to the zip to see for yourself if you can find where the bug is coming from this time 'cause I already replaced the asset manager. And for an other project the game loads properly but the music doesn't play in the Main screen. Sorry for not replying sooner. Indeed i didn't receive a notification. I don't understand why the notification system works this way, it only sends notification if you logged in to see the last response or something. 1) After some digging i found you had a sound file posing as an image. I don't know how you got there, but if you remove the image "Zoltan_Percsich_-_The_Gift" from your project, it should run fine. However what i found strange was even with the project intact and running it from Belle, i was able to run without problems. On the other hand running directly from the files you gave me didn't work and behaved as you described. 2) As for this one, i opened the project in Belle, so i could see what was the main sound you mentioned. After that i did some digging as well, looking at the code, doing some debugging, making some tests, to then opening the project again, after not being able to find any problems in the code, and realizing you had the sound playing after a "Wait forever" action! So that's the problem, you need to put the play sound before the wait action. I know this was probably a distraction, so no worries, it happens. I also noticed the some animated images were very fast in game. Did you notice this too? I didn't look much into this issue, but i can look more tomorrow, if you want. Finally just wanted to say thanks for using Belle again. How did your first project go, after that initial hiccup? Hey, sorry for the annoyance. I love using Belle so this is always cool to come back and see what can be be one with it. The very first project runs fine. I made some update by customizing the GUI a little bit and reuploaded the zip and nobody has had an issue with it. I'd pay attention next time. 2) Same with the second project. I truly didn't think the "wait" action had an impact on the sound. Well, now I know . Also, like you, I noticed the problem with the gifs. I don't understand why in-game they loop faster than they should. If you have a fix to propose please do. No problem, glad to help. Also good to hear about your first project. 2) There was a problem playing the gifs because, in order to play them, they have to be split into frames and then played "manually" by Belle. However i was able to fix it. So, like before with the sound issue, you have to update some files in the engine to apply the fixes. It's nothing complicated, but i understand it can be a bit annoying, sorry about that. Anyway, the files are the ones attached. If you have any doubt or issue, let me know. Hope it helps. PS: Just noticed i sent you the sound fix more than 6 months ago... Damn, time flies by fast. Hadn't realized it had been that long. I'm already working on the next version though. But i'm not sure when i'm going to release it, i'm hoping sometime in the next few months. If you have any feature requests let me know, maybe i can add them for next release. Thanks for the fix. I'd make all the changes this week-end cuz I'm a little sick right now. It's hard to focus. l let you know if it's working. I'm happy to hear the next version is on its way. When I imported a "Hunter's Tale" from Renpy to Belle, I had to let go several effects like horizontal and vertical pan, zoom and blossom(Maybe I record the screen to show you how it looked like). I tried to think of a way to make a blossom gif but it didn't really work. Maybe you'll come up with something later, ^_^. I will wait until the new engine is released to import other projects. I think it'd be good way to test it. Sure, no problem, get better first. Belle is really lacking on animations and effects, but i'm planning to do a significant rewrite of the engine for the next version, with that in mind. I'll probably use a library like Phaser, which already has mechanisms for doing animations. After that i think it would be easy to add all sorts of animations. If there's no urgency to port your projects, i would agree that waiting is a good idea. I've replaced all the scripts and completed the project(still some editing to go through, hunting the typos and stuff) but everything is running smoothly. All the gifs are acting as originally planned and no sound issue to report. Once again thanks for the fix. The game got tested on Newgrounds. Sadly I cant just link to it since the website doesn't allow private links like itch.io when the game's unpublished. So I screencap'd the test so you can see it for yourself. Here the screenshot provided by the tester. 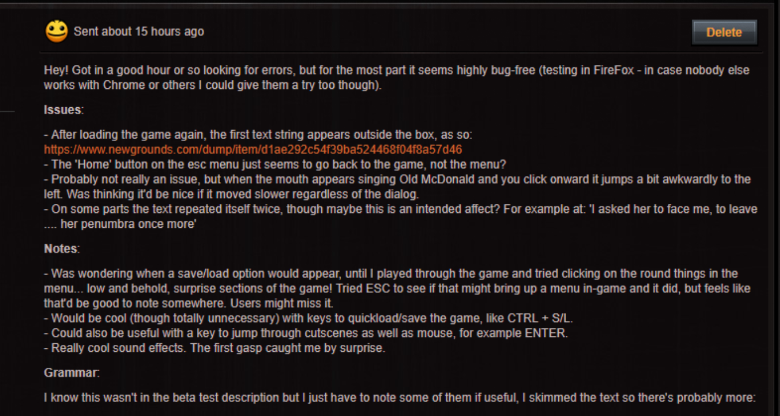 If anyone wants to join in the beta test, go to this thread. Last edited by VideaVice on Fri Apr 06, 2018 4:10 am, edited 1 time in total. Sorry just recently i noticed you edited your comment. 1. I was able to reproduce it, but i don't know why it happens. I need to look more into it. I'll let you know once i find the problem and fix it. 2. If the home button is the same as the resume button from the default template, then that is to be expected. Let me know if you prefer another behavior. 4. This seems to be on purpose, but let me know if it's not. 2. It's a cool feature, as mentioned, but not that useful in my opinion. Also i'm not sure it's possible to do, i would have to check, but i think it is doable. 3. This is actually a bug i fixed in the version i'm working on right now. Again, if you think this is worth correcting i'll send you the fix. That's cool no problem. I know it can take some time to see the messages. 2. I'm fine with default behavior. The player thought the home button will send him back to the main menu. I'll make another set of icons and remove the "home" since it seems the confuse the player. 3. Yes, he wanted the animation to play while he was still reading. He made the same remark about a scene of the previous game(A Hunter's Tale). 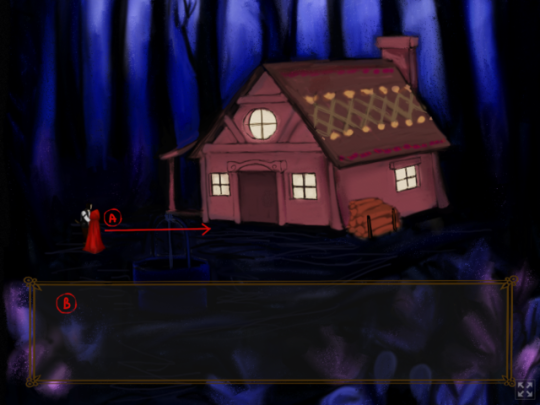 The player must stop reading if he wants (A)to watch the sprite fully complete the translation on screen and (B) then the new text appears in the textbox. I think it's not fluid enough and took him out of the game. 4. It was a mistake. I pasted the same line twice. I was probably falling asleep. 2. Regarding the save/load button, I think I'm just gonna redesign the dialogue box a little to fit it at the bottom of the screen for each scene. 3. Yes. It'd be great. I've got new interesting test, to share. I tried it and he's right. It's impossible to jump back in the game from here. If I play the whole story and reach that point, there's no freezing. I just pick one option and branch out to the appropriate scene. Saving on the screen menu just stops the game and I must reload. Sometimes it takes a bit to check the problems, but this time was that i didn't receive a notification because you just edited the comment. Anyway, no problem with me, but it might be detrimental for you because i may not notice it in a reasonable time or at all. 1. I was able fix this problem. It's also associated with another issue mentioned below. I've attached the file with the fix (game_model.js). 3. Attached the 2 files with the fix (game_controller.js and views.js). It's possible now to use space or enter to proceed the story. 1. I don't have much control over this fact. Belle just tells the browser to play and it should play immediately. Maybe the solution will be Web Audio instead of HTML5 audio, which is more recent and more oriented to games. But that will take some time to implement. 2. That's the same problem as in issue 1, so it's fixed. 3. This problem is related to issue 1 as well, so it's also fixed. 4. I don't know what this could be. The rest you probably know better than me, so i don't think you need my help. Sorry for this inconvenience. Hope it's all good now. I'm going to change the scripts and see how it works. In the meantime, I give you the file used for the test, just in case the "freezing menu screen" thing is due to something I made and don't actually requiere fixing. Everything seems fine now. However i did find some small issues that might be giving the wrong perception to the players. First, i think i now understand what the tester meant by the sound being "out of sync". I think he's referring to the gasping sound (gasping-gasp-breath-1-child-deep-scared-startled-inhale-human-voice-kid kitchen monster.wav), which you only hear the gasp 2s after the sound is played, so it maybe causing that "out of sync" perception for the player. Another thing i noticed, that maybe related to the perception of lagging, is that you sometimes hide the objects at the beginning of the scene. This will likely make the objects visible for a fraction of a second and then hides them very quickly, which might look like lag or some sort of glitch. So to avoid this i would recommend to hide the objects from the start and for that you have to untick the "Visible" checkbox on the objects' properties. Then you don't need the Hide actions at the start anymore, the objects will be already hidden. Just another small thing and this is just my personal opinion. For example in the scene "Choose Wisely", it's not very obvious what the player has to do. The objects are really well blended into the scene, which is awesome, but at the same time to me, in the first time, it just seemed i needed to wait for something, because i thought i was looking at a background only. You know what i mean? Maybe add some border around the objects. Yeah, I will try to edit the sound to sync it with the picture. I didn't know hidding throught properties could hide better. Thanks for tip. I change that too. The fake "imagemap" gonna be modified as well. I'll just make the objects straight up red. They won't miss them in the room. Thanks for lookin' it up.